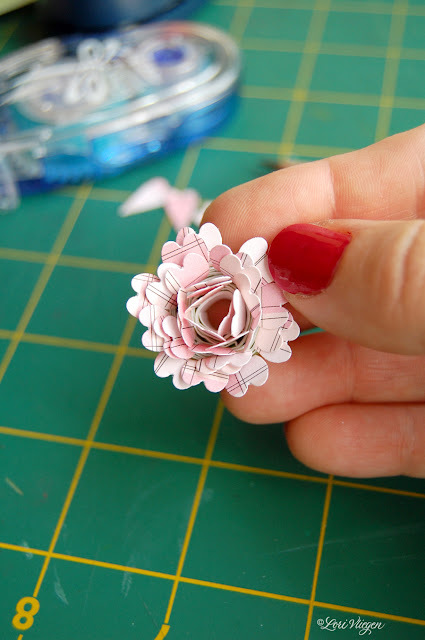 this punch that creates really cute paper flowers. i was really inspired by this idea, so here's another way to create a paper flower using supplies that you probably already have. 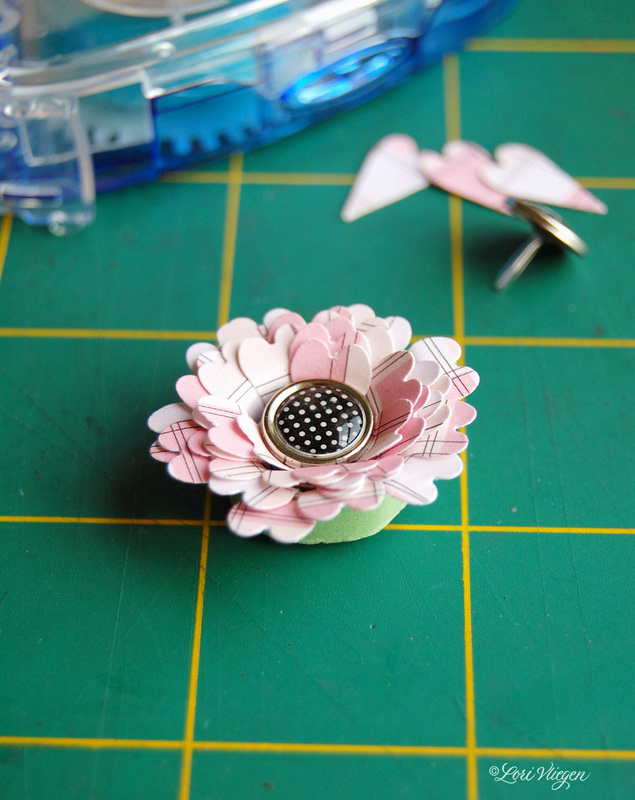 to make a flower, all you need is some paper, a paper punch, and strong adhesive. 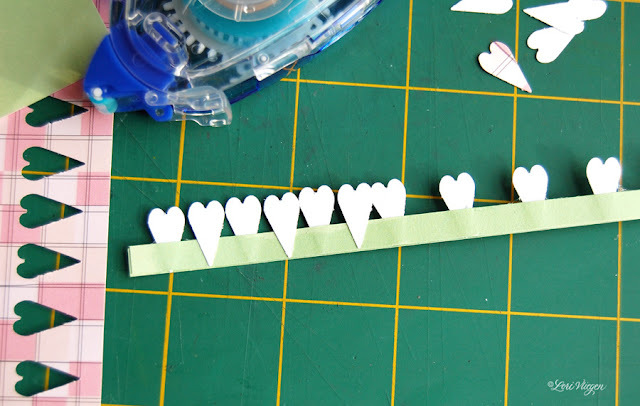 for the base of your flower, cut two strips of paper about 1/4" wide and 12" long. (these will be the petals). now apply some adhesive to your strip of paper. you can use double-sided tape, glue, or some of the industrial strength red craft tape.....you just want it to be strong! 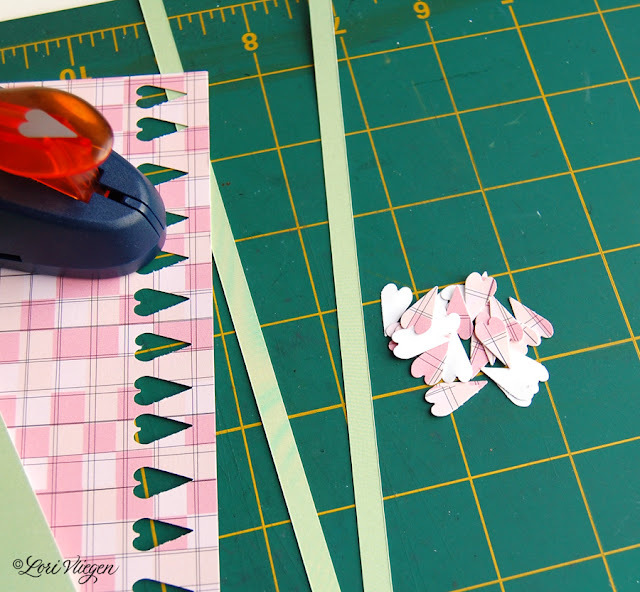 now lay your paper shapes onto the paper strip, spacing them evenly across the strip. 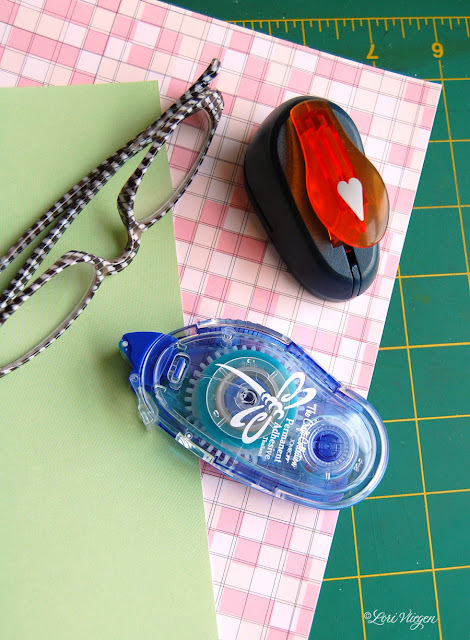 if you're using a paper that has a pattern, lay it pattern- side-down onto the strip. now lay the second strip of paper onto the top of the first (the adhesive on your first strip will help attach the second strip). 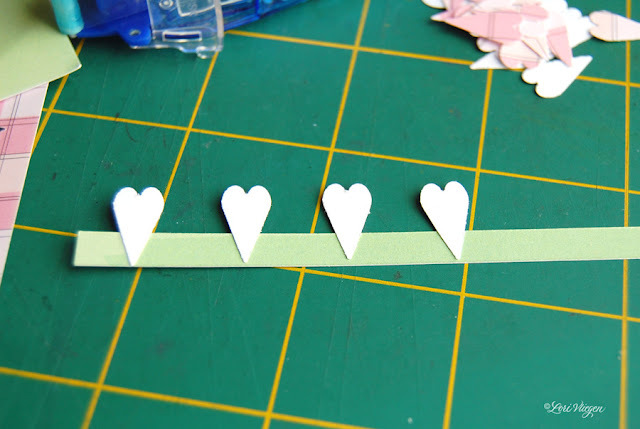 apply adhesive to the second strip and lay more shapes in between the shapes of your first strip. once your strips of paper are completely filled with punched shapes, start to roll your paper strip into a coil (you can wrap the end around a pencil to get it started). roll your strip with the adhesive side out......the adhesive will help the paper stick together as you're rolling. 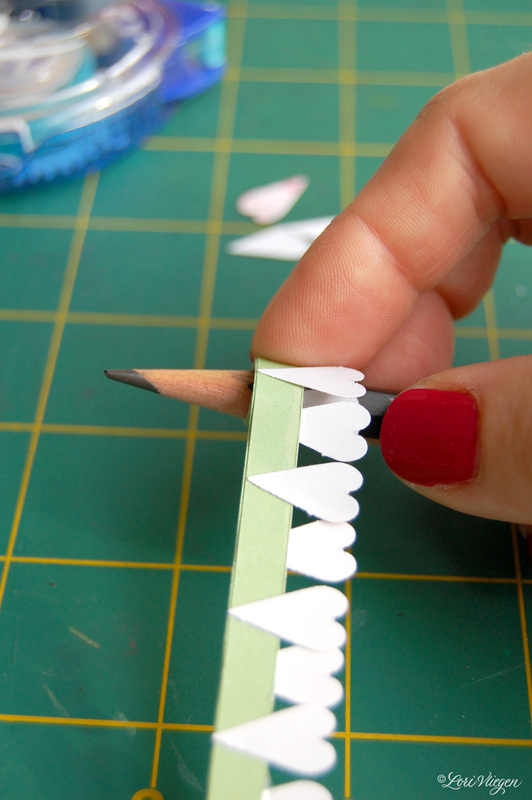 once you've completely rolled your strips, place a dot of glue at the end of the paper to keep it from unraveling. now gently bend the tops of your petals outward to start forming a flower shape. 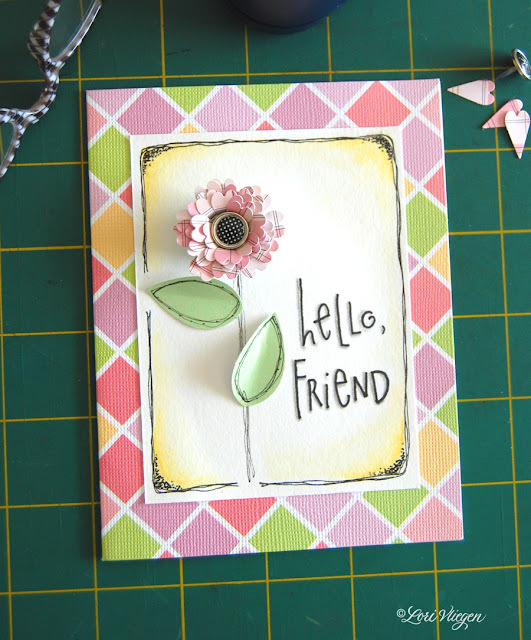 and then attach your finished flower to a card, small canvas, or art quilt! these are so much fun to make, you'll have your own little art garden in no time! This is fabulous!!! Love how you used the hearts and the card looks gorgeous!! Happy Monday to you! What a great tutorial! 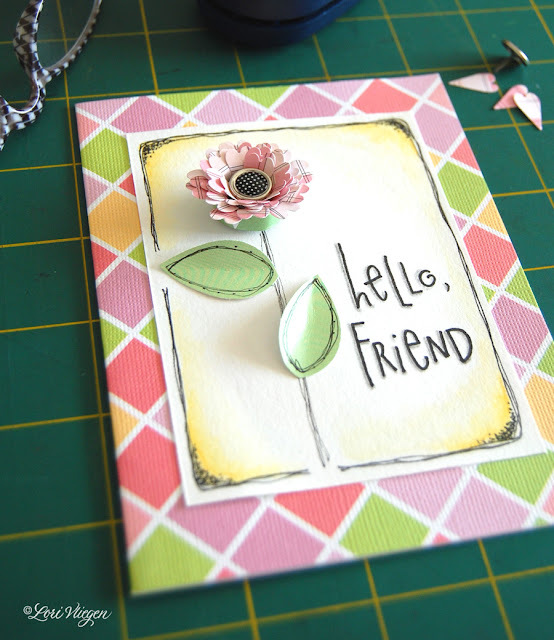 It makes a darling card but has lots of other applications too! Thanks for sharing. oh my gosh~! That is the cutest thing I've seen in a long, long while! SWEET! Adorable. And so fun! Thanks Elvie! Love, love, love these cute little flowers...and the card is wonderful! Seems like every month I'm having to add to my supply/tool stash because of something you post, which is a-ok by me! Oh my...this is just darling! Taking something simple and making something beautiful out of it. I love your card and will have to try my hand at it. Thanks for sharing. It's adorable. "Bravooooo, bravoooooo" like to the italian opera. Your imagination sharpen one's wit!!! What a little big idea! xoxoxo Eulalia, your nutty friend. You are so clever. Where do you GET these clever ideas? Do they land on your head like raindrops? How sweet and cute is this! Thank you Lori for the tutorial. I just so enjoy your art!! Fab flower. I haven't got a small heart punch so I might experiment with a different altogether! Guau, como siempre, qué original! Es un placer tenerte todos los lunes!!! so perfectly adorable with your charming art! Thanks so much for this! !I asaw a punch the same as this, but just didn't think I could use it that often..Boy was I wrong after seeing your lovely tutorial! Would you consider not having Word Verification on your comments..it is so hard to read. Oh, that is SO flippin' COOL! Another brillant idea! Thanks for the tutorial I'm going to have to try this myself. Super-duper cute!!!! What an ingenious idea. Your creativity and cleverness will never cease to AMAZE me!!! Have a week filled with blessings (& chocolate)!!! Awesome! Thanks for the tutorial. I LOVE this Lori! Thanks for showing how to make it...it would have taken me way too long to figure out on my own. Hee Hee.